Click here for details, and if you've shot pics of DC, then you've got no excuse not to enter this! Like the Census, they seek portraits representing people of all ages, all four races, and the many ethnic groups in each quadrant of the city. Fifty-one portraits will be selected and exhibited. Foundry Gallery and the Kurdistan Regional Government Office in the District of Columbia will be sponsoring a show of the work of Kurdish artists. Exhibit Dates: March 3 - 28 and the Opening Reception is tonight, Friday, March 5, 6 to 8PM. Foundry is also welcoming applications for new members. For information on membership and how to apply, please click here. Up and coming artist Elena Patiño is one of the artists showing at the Hillyer Art Space show which opens tonight. Keep an eye on this refreshing new artist. First Friday Reception: Friday, March 5th, 2010, 6-9PM. To DC area artist Terry Ward for recently having had the honor to hang with the famous Arnaldo Pomodoro (the maker of those bronze spheres in cities and museums worldwide). Ward's 2009 mixed-media Begotten, Forgotten panels (pics here and an essayhere) were on the "Rothko stripe" wall behind Pomodoro's 1962 bronze Traveler's Column (on loan from the Hirshhorn Museum) at the new gallery building at Smithsonian-affiliated Annmarie Garden and Sculpture Park until March. Call for Exhibition Proposals: 39th Street Gallery at the Gateway Arts Center at Brentwood. 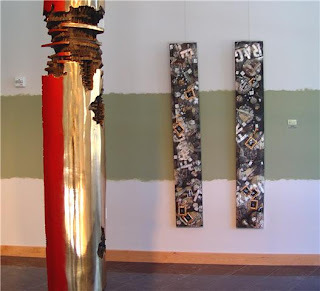 The 39th Street Gallery at the Gateway Arts Center at Brentwood is currently seeking proposals from artists and curators nationwide for an exhibition to take place May 10-June 25, 2010. Proposals may be for a self-curated solo show or a curated group exhibition. All original artwork in any media, including installations, will be considered. * Application deadline: Friday, April 2, 2010. Applications must be received by 5:00 pm at the Gateway CDC office, address below. * Notification: by April 10, 2010 via email. Materials will be returned at the artist's or curator's request if SASE provided. * Reception: To be arranged according to needs of exhibition. About the Center: The Gateway Arts Center at Brentwood (GAC@B) is a multi-faceted facility dedicated to the production, exhibition and programming of visual art. The center serves as a dynamic resource for artists and a vibrant, creative social experience reflecting and engaging a diverse community. The GAC@B houses the 39th Street Gallery and Project Space, twelve artist studios, the Prince George's African American Museum & Cultural Center, and The Brentwood Art Exchange operated by the Maryland-National Capital Park & Planning Commission. The GAC@B is a place for people of all ages to meet, engage and learn about art. About the 39th Street Gallery and Project Space: The 39th Street Gallery is dedicated to fostering innovative, creative exhibitions and projects that engage artists, curators, critics and the public in a contemporary art dialogue. An artists advisory group reviews proposals at stated deadlines and on an ongoing basis. The gallery is 450 square feet; floor plans are available at this website. It features high, open ceilings, a bank of windows along the southwest wall, track lighting, and pristine white walls. There is close access to the loading dock, just outside gallery entrance. Gallery hours: At present, the Gateway CDC can staff three shifts weekly; Thursday and Friday evenings from 7-9pm, and Saturday afternoon from 12-4pm. The artist may open the gallery for additional hours, pending staff approval. Honorarium: The artist(s) or guest curator will receive up to $500 honorarium. Commission: Gateway CDC will take 25% commission on sales during or as a direct result of this exhibition. 1) A statement about the proposed exhibition, one page maximum. 2) A CV or resume that includes contact information. 3) Work samples: 10-15 images provided via CD-ROM or weblink. Web images should DIRECTLY support this proposal, do not send a link to your whole website. 4) List of works. This should clearly correspond to images. Please indicate title, date, media, dimensions and price or insurance values as appropriate. · Please number each image file corresponding to the list of works. · Image files should not be larger than 1MB, and should be formatted as jpeg. · Video and audio submissions may be submitted as a DVD, or on a CD and formatted as Quicktime, Windows Media, .wav, or .mpeg files, as appropriate. For more information contact John Paradiso via email (john@gateway-cdc.org) or phone (301-864-3860 ext. 3) or visit this website. Isabel Manalao's wonderful The Studio Visit website has a new URL: www.thestudiovisit.com. Visit often! An unprecedented gathering of underground artists convenes in the Washington, DC metro area (in Crystal City) this month. In an artistic interpretation of the G-20 political summit, G-40:The Summit will occupy 75,000 square feet of exhibit space on four floors of an empty office building in Crystal City. The Grand Opening is Saturday, March 6th from 8 p.m. - 12 a.m.